YouTube today unveiled a new masthead, which brazenly shows off just how many people visit the site on a daily basis. it's merely one big brag. If you click on YouTube.com, you will see that its logo has changed to show that the site gets 1 billion hits. A day. That's right, 1 billion videos are viewed in 24 hours – that's the equivalent of a sixth of the world's population logging on to watch a cat jump around in a funny way, or to see the latest failure/winner on X-Factor. A quick look doesn't actually bring up any new functionality. 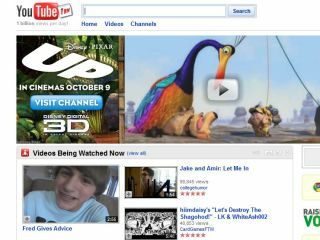 The only big change is a massive amount of advertising for Disney Pixar's latest offering UP – quite apt, given just how high YouTube's stats actually are.